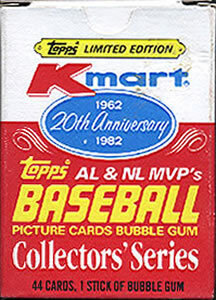 The 1982 Kmart 20th Anniversary MVP Series Set is perhaps the most anticlimactic set in the history of baseball cards. Produced by Topps and distributed only through Kmart stores, this 44 card set featured cards of the National and American League MVPs from 1962 to 1981, and is reminiscent of the 1975 Topps MVP subset. The set was packaged in its own stylish box and came with a monster piece of bubble gum. So how does this set sound so far? All MVPs from the Wonder Years of baseball; cool "limited edition" box; awesome bubble gum; man, this set sounds tubular. Alright, let’s open this box and check out the cards! Oh. Yeah. Um. That’s it? Crooked reprints of Topps cards on a predecessor homage to the Topps Turn Back the Clock design? How…sterile, safe, prefab. I received this set as a gift from my Dad way back in the summer of 1989. I believe he bought it at a garage sale in Nowheresville, Indiana. At the time, I actually really did like this set. As a young collector, I enjoyed looking at reprints of “old” cards and it helped me learn about players like Zolio Versalles and Elston Howard. Yet, over time, this set wore on me like a pair of pants two sizes too small. Little things started to bother me, like the cards pictured are not the cards for when the players were MVP. 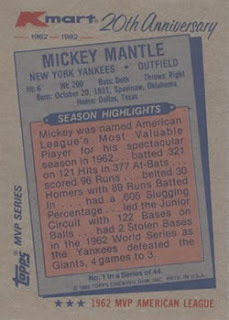 Roger Maris won the MVP in 1961, so why is Mickey Mantle’s 1962 card shown? 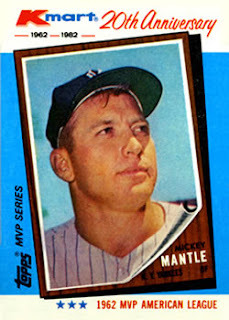 Mantle won the AL MVP in 1962, so his 1963 Topps card should be shown, etc., etc., etc. Also, Maury Wills didn’t have a 1962 Topps card, and that 1975 version of Fred Lynn never existed. Well, maybe those two cards are alright. I wish the set could have been full reprints of the original cards with Kmart emblazoned on the top right of the front to alert collectors that it is in obvious reprint. However, there is one saving grace about this set, and that is it’s an easy way to obtain a Mickey Mantle card for next to nothing. As someone who was collecting in 1982 when this set came out (and my brother worked at Kmart at the time), we thought it was fantastic. The days of a zillion Fleer/Ames/Kay-Bee boxed sets hadn't arrived yet, so the Kmart set was pretty unique. It doesn't hold up well at all, and I think it might be the most produced set of all-time, but every time I see it, I think how cool we thought it was at the time. That is an interesting perspective Night Owl. I imagine it was a pretty cool sight in 1982 to see reprints of earlier cards. Thanks!